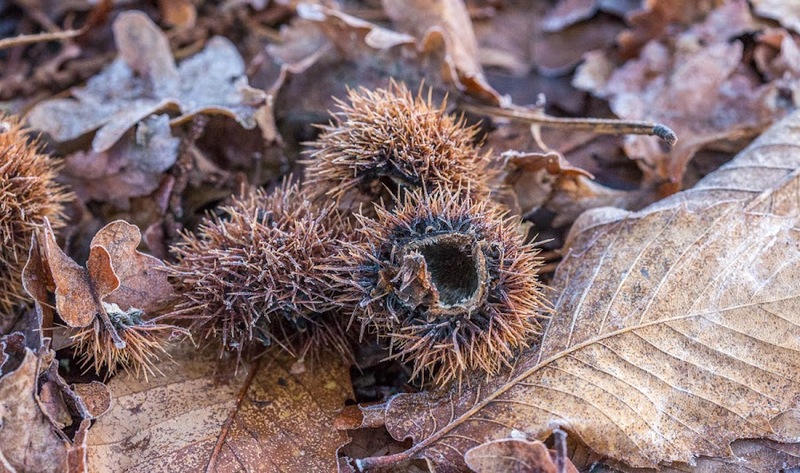 These chestnut hulls on the ground near the woods where Callie likes to walk reminded me of sea urchins. Apparently people eat sea urchins, but I've never tasted one. When I see them being opened and eaten on television, they don't look all that appetizing, and there's not much to eat in one urchin. Perhaps they're an "acquired taste." I wouldn't be against trying (after all, I eat snails and gizzards), but I'm not rushing out to get some. Chestnuts are edible, but it's easier to buy them in cans and jars, shelled and cooked, ready to use. Enjoy your New Year's Eve! It's unlikely that we'll make it to midnight, so we'll be having our New Year's Eve oysters at lunchtime, as usual. Tomorrow we have black-eyed peas on the menu. Yum! Jacques Frost has been busy these past few mornings. With lows just under freezing, we wake up to a frosty landscape. That's normal for this time of year, of course. But it doesn't really feel all that cold outside. For one thing, there is no wind. That makes a big difference. Wednesday's light frost gave everything a little tinge of white. Also, the sky is clear and the sun shines. That is, it did until yesterday afternoon when a thick fog formed. From what I can see out the window this morning, it's still pretty foggy out there. The sun won't be up for another hour and a half. I'm hopeful it will be able to burn off the fog, but it may not. We could be in for a gray day. As predicted, our mornings are now colder with lots of frost. Callie and I had a nice walk on Wednesday morning, and she came back with frosty paws. That's much better than muddy paws; a quick wipe with a towel and she's ready to come inside. No fuss, no muss. 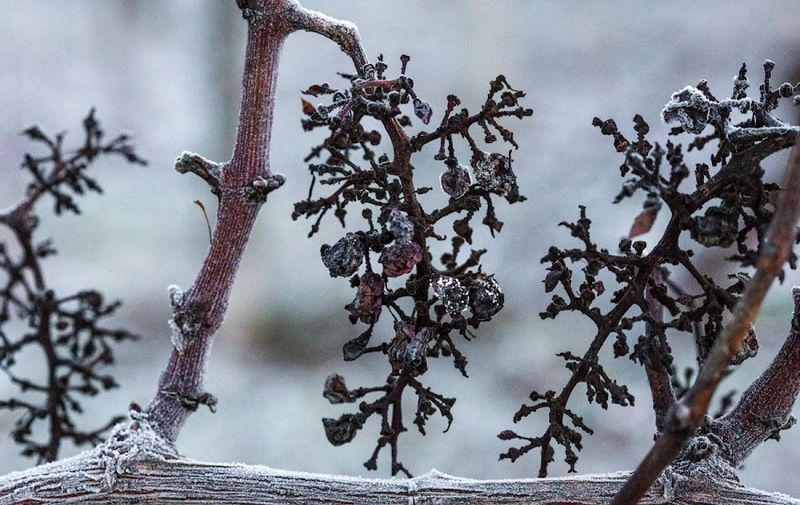 A few grapes that the mechanical harvester missed, now dried on the vine and touched by frost. We're sliding toward the new year. On Saturday we plan to go to the market for oysters, a traditional New Year's food in France. Ken's been thinking about crab, so we might also look for tourteau at the fish monger's stand. It's another typical French holiday food and is often sold already cooked. I remember Thanksgivings at Gram's from when I was a kid. Lots of activity, the dining room table extended for a crowd, the smells of holiday fare emanating from the kitchen. Gram had a big turkey roaster out on the enclosed, but unheated, back porch off the kitchen, a kind of stand-alone electric oven into which a very large turkey could be lowered for roasting. The cover lifted off for periodic basting of the bird. I've never seen another one like it. A small serving of Aunt Kathy's cranberry relish. 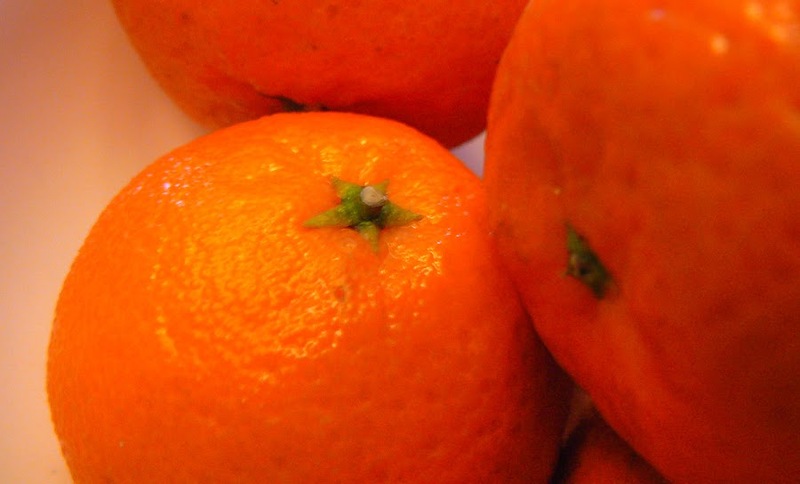 Sweet and tart! Along with the mashed potatoes, gravy, stuffing, yams, and a myriad of vegetables, there was always cranberry sauce. It was the jellied kind from the can, of course, slid out and sliced into deep red disks. I loved that stuff. But there was also another kind of cranberry sauce, a sort of relish, that my Aunt Kathy made. I learned to like that even more, and have made it for my own table for many years. I don't think Aunt Kathy invented it, but I wonder whether it was a family recipe, one she found in a cookbook, or if the recipe came from the back of the bag of cranberries. Wherever it came from, it was simple and delicious: a bag of fresh cranberries, an unpeeled seedless (navel) or seeded orange, and a cup of granulated sugar. She put all the ingredients in a blender and chopped them into a relish, then let it sit for a few hours. 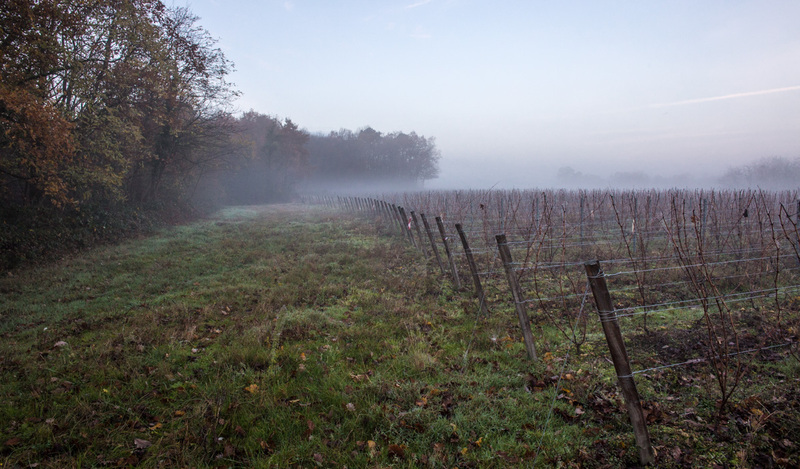 It's very hard to find fresh cranberries here in the French countryside. We've found them a time or two (and thanks to a friend up north, had them mailed to us one year). This year I wondered if dried cranberries might work. We find those, partially dehydrated like raisins (in fact, I think there's a similar product in the US called "craisins"), in the supermarket here. I soaked the cranberries for a while to reconstitute them and made the sauce in the food processor as normal, except that I used less sugar because the dried cranberries are already sweetened. It worked! The flavor is not exactly the same as it is with fresh berries, but it's close enough, and we ate it up with our Christmas bird. We even enjoyed it with foie gras! Celebratory food is often about memory and this cranberry sauce always reminds me of those holidays at Gram's house. Thanks Aunt Kathy! I had a "senior moment." They're becoming more and more common around here. Ahem. I ordered a traditional French holiday yule log cake from our local bakery to have for dessert on Christmas day. It was delivered on Saturday afternoon. 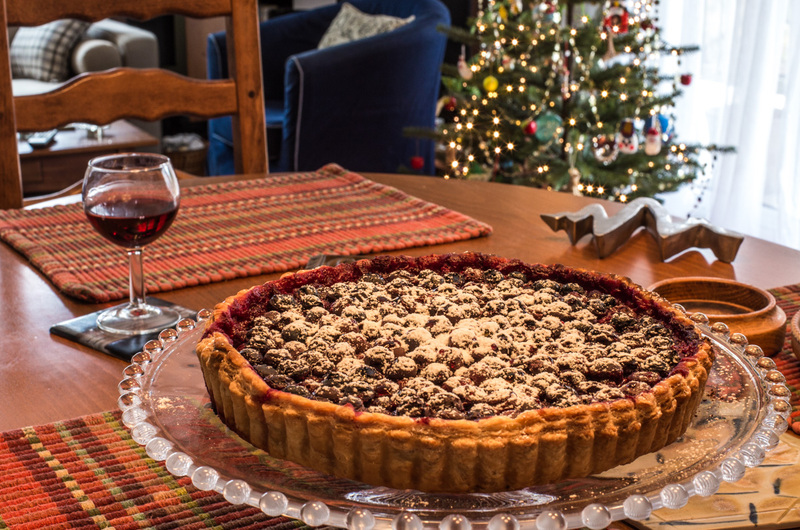 Earlier that day, in a flurry of activity, I made a blueberry tart for dessert on Christmas day. And it wasn't that I forgot about the cake. I just had it in my head that I needed to get dessert made on Saturday because the oven would be in use on Sunday morning. A blueberry tart sprinkled with powdered sugar. ... Pâques aux tisons. That well-known French proverb may very well apply this year. It means, "Christmas on the balcony, Easter in front of the fire." In other words, if Christmas is warm, Easter will be cold. And this Christmas was very mild. We'll see what it's like in mid-April. Nothing says winter in France like clémentines. I love them. Sorry for the bad photo. Today is supposed to be the last warm day for a while. 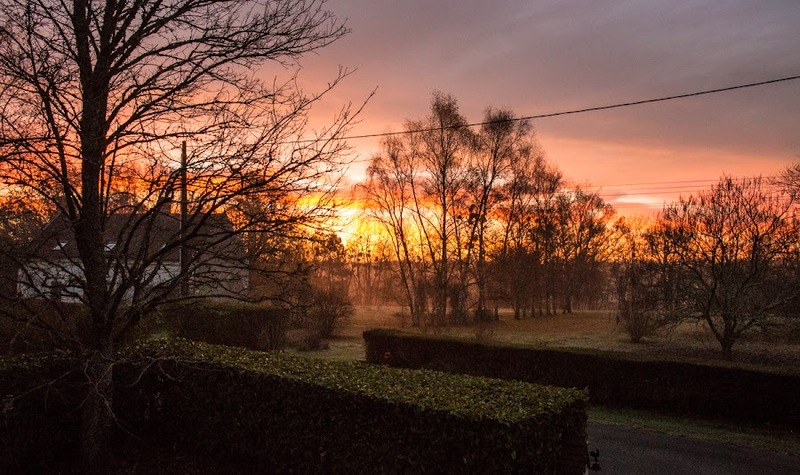 Temperatures are predicted to chuter (fall dramatically) by Tuesday morning, with lows near or below freezing for the week, depending on whose weather forecast you consult. I'll certainly keep you posted. This is an oldie, but goodie: Callie as Puppy Claus. 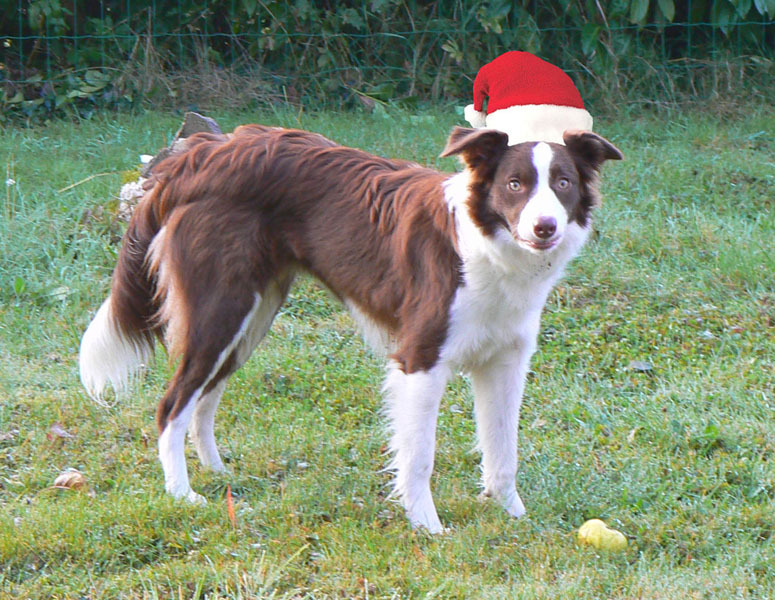 She was just a year or two old and I photoshopped a Santa hat onto her head. Puppy Claus brought Callie a whole bunch of rawhide chews this year. Enjoy the holiday if you're celebrating! Enjoy Sunday if you're not! And if you believe that, I've got a bridge for sale. 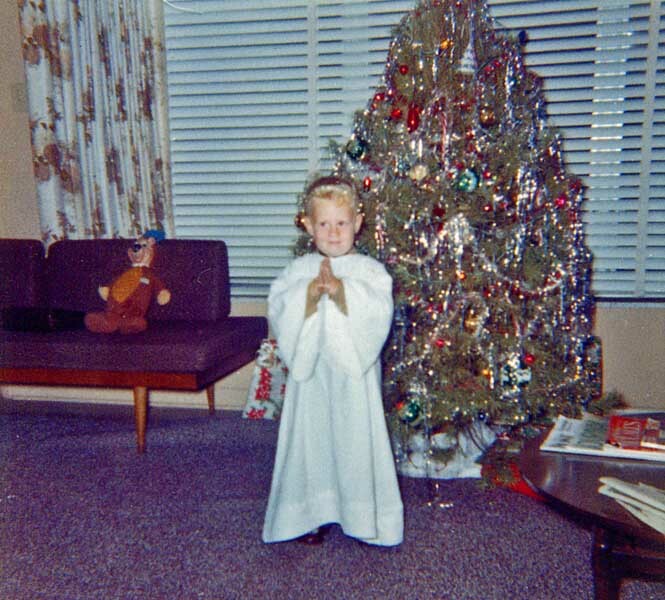 Back in 1962, someone in my family (mom? dad? nana?) decided I would look cute dressed as an angel. Must have been my sweet disposition. It was my first public appearance in drag. Well, it got that out of my system, except for a certain Halloween in the seventies that I'm sure worried the heck out of my parents. And what's up with the purple sofa? Today, being Christmas Eve, we will make our traditional fondue savoyarde (cheese fondue) for lunch. And we'll be starting the prep for tomorrow's lunch. Ken will pick up the bird from the market this morning. He'll make broth with the giblets that will go into the cornbread stuffing. I'll make another pie and some cranberry relish (using reconstituted dried cranberries; we'll see how that goes). When I opened a bottle of de Castellane Champagne on Wednesday, I noticed this little piece of art on the capsule. It's an archeologist entering an ancient Egyptian tomb. 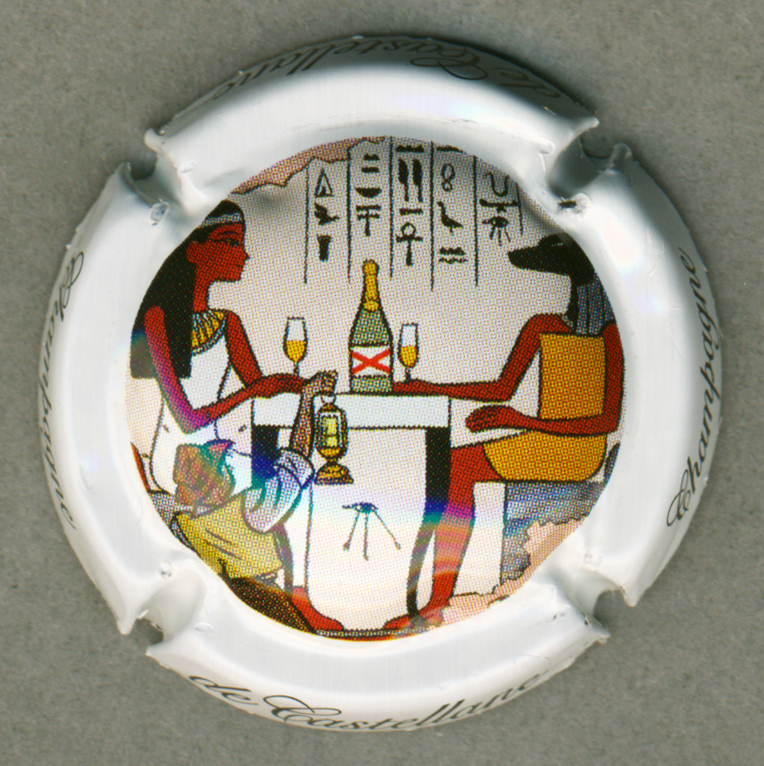 Among the hieroglyphs is an image of a woman and a god sharing a bottle of de Castallane Champagne! Who knew? All the cops in the donut shop say ay-oh-way-oh. Although I'm not a real enthusiast, I do have a small collection of these Champagne capsules from many bottles I've opened over the years. Some are displayed in a coin box, others are sitting in a drawer. They remind me of some of the great sparklers I've enjoyed from California to France. This one is a definite keeper! Another birthday has come and gone. We ate it well. This year we made the traditional steak au poivre with a cut of beef we don't usually indulge in: filet. In the US, we call that cut the tenderloin or filet mignon. In France, however, the word mignon is normally used to refer to same cut of pork, not beef. Since filet is one of the more costly cuts of beef, we often use faux-filet (sirloin) or rumsteak (rump or round) for this dish. A dish of snails, six per serving, with garlicky parsley butter. 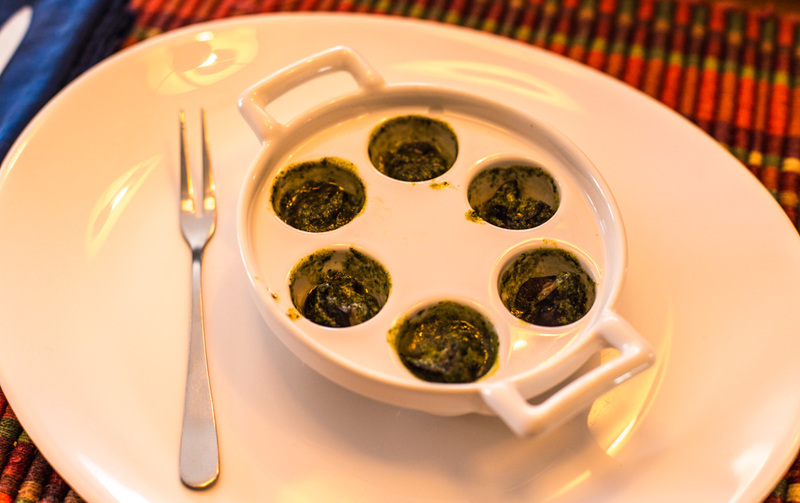 We each had a half-dozen escargots de Bourgogne as our entrée, prepared the traditional way with a garlic and parsley butter sauce. The steaks were dry-marinated in crushed black pepper before being seared in a hot pan. The sauce was made by de-glazing the pan with Armagnac and a little beef broth, then thickening it with crème fraiche. We served the steaks with french fries. We followed that with a green salad in vinaigrette. Lunch is served! They look like hamburgers, but they're slices of filet coated with crushed pepper. I drank Champagne with the entrée and Ken drank sauvignon blanc (he doesn't really enjoy the bubbles). We enjoyed a Saint-Nicolas-de-Bourgueil (from a little further down the Loire Valley) with the main course. Dessert was an apple tart. I used Delblush-Tentation apples. First I made a compote with some of the apples, a little sugar, and some cinnamon. I pre-baked my pie shell, then spread the cooled compote inside. 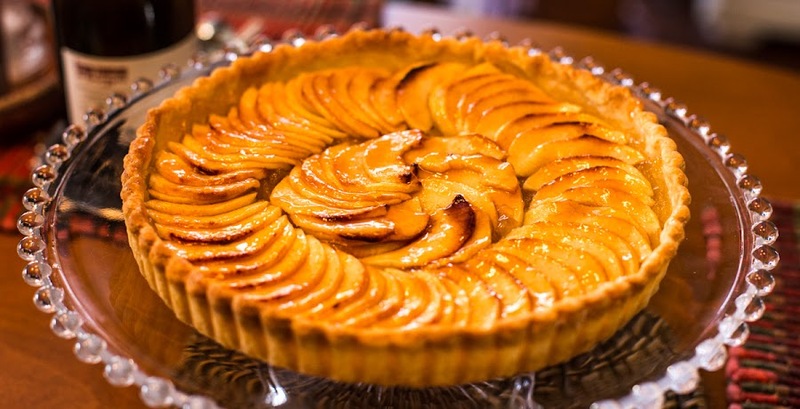 I layered sliced apples on top and baked the tart until it was done. Finally, I glazed the top with some of Ken's home-made apple jelly. Tasty! 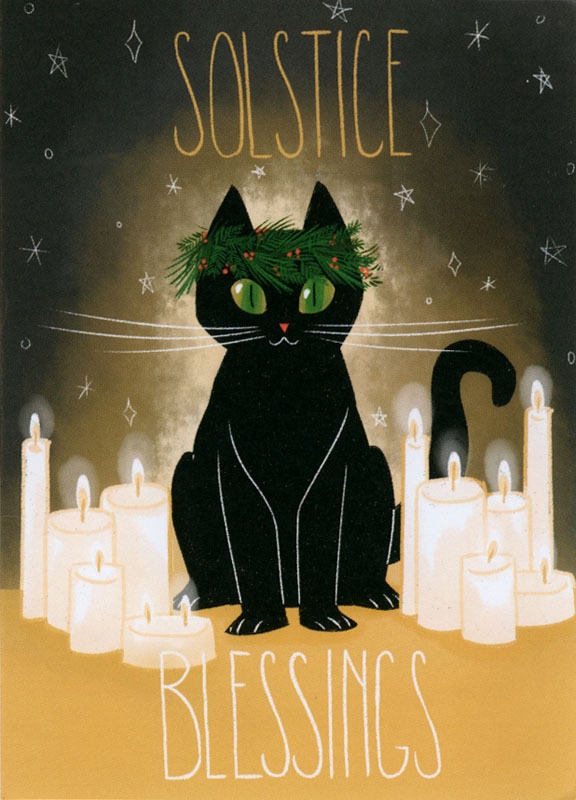 Today is the winter solstice. The point at which the northern hemisphere's tilt away from the sun reaches its extreme. Our shortest day of the year (and longest night). For the next six months, the tilt will gradually move back toward the sun, increasing the amount of daylight we get. Until the summer solstice. The Earth's tilt and its orientation to the sun through its year-long orbit are why we have seasons. Ain't science grand! I recently received this terrific birthday greeting from my dear friends L&L in upstate New York. It's also my birthday. Another reason to celebrate! 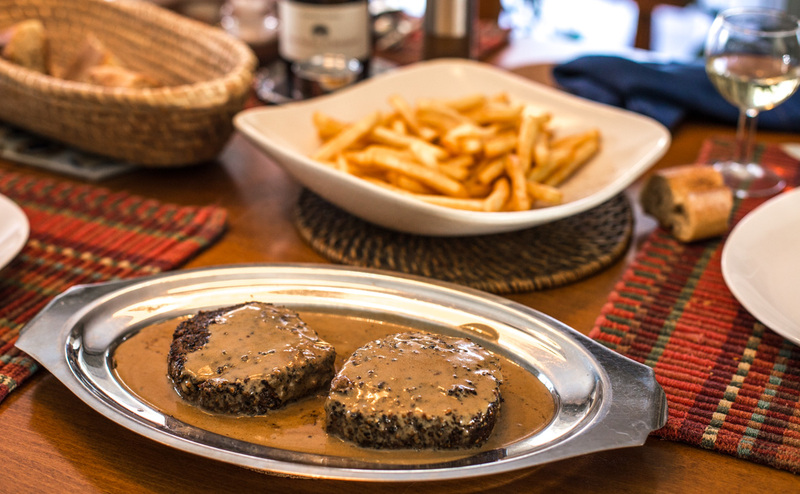 And celebrate we will, with my traditional birthday dinner of steak au poivre (pepper steak) in a cognac cream sauce, served with frites (French fries). We'll start with an appetizer of escargots (snails) in the traditional garlic, butter, and parsley sauce, and finish with an apple tart, which I will get started on making early this morning. I got a few comments about the Eiffel Tower ornament on our holiday tree, so I thought I'd rerun a photo of it from ten (!) years ago. I found the ornament in the museum shop at San Francisco's Palace of the Legion of Honor back in 1998. I think I was there to see Picasso's "Guernica," if memory serves. It's a fragile glass ornament, so I try to be very careful with it. We had a cut tree in 2006. Today Callie goes back to the vet for a booster shot. She got a new version of her annual vaccine last month, and the vet said it would require a one-time booster after thirty days. In subsequent years, the booster won't be necessary. 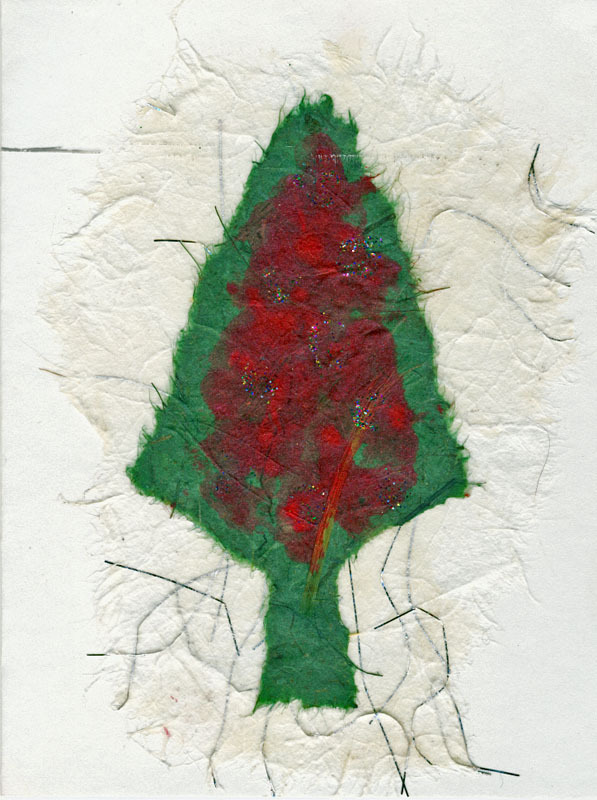 Our friend Sue in California has a tradition of making her own greeting cards, especially during the holidays. Sometimes it's a photo she's taken, other times it's more of a craft-like card. I've saved many of her creations over the years, but I know that I'm missing many. Sue's Christmas creation from 2004. This was the card she sent us for Christmas in 2004. It's one of the few I have with a date on it. I wish I had put the dates on the others I have, but I obviously never thought to do it. At least I thought to save them! Speaking of IKEA, our real fake holiday tree is Swedish. Several years ago I gave up on cut trees in favor of this artificial one. I haven't looked back. It's easy, clean, looks good, and I don't have to water it. On the other hand, it doesn't smell like a cut tree. But I have enough of that outdoors; we have three fir trees on our property and are surrounded by dozens more. This year the lights are all white because I put the colored lights outside on the house. It's good to change things up a little (but not too much). I went to the market yesterday and placed an order for our Christmas bird. This year we'll be roasting un chapon de pintade (a capon of guinea fowl). A capon is a young, castrated rooster, very good for roasting. I'll pick it up at the Christmas Eve market next Saturday. I also ordered our dessert from the local baker: a yule log cake with coffee flavored pastry cream. Now all we have to do is wait for Puppy Claus (he's comin' to town). It went up a lot more easily than I expected. It took a couple of hours on Thursday morning, some help from Ken, and no clamp (the clamp is necessary to attach two cabinets side-by-side). 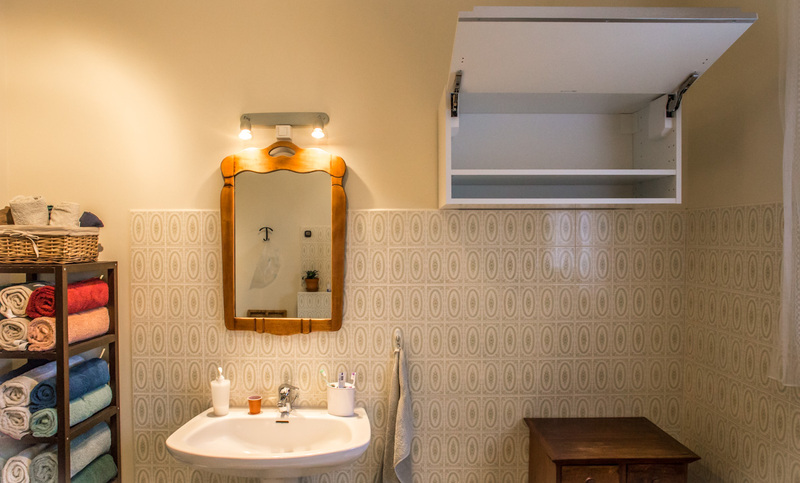 As I mentioned, this is a kitchen cabinet, so it's a little bigger that what you might expect in a bathroom, but it works for us since we need all the storage we can get. There is only one closet in the house. The halogen light fixtures (there's also one on the ceiling) are 13 years old. I'm thinking about replacing them with LEDs. So there you have it. I have some framed pictures and a clock for the walls; I'll put them up soon and the room will be more or less finished. We've had that mirror for over 30 years. I've put together a good number of IKEA items, and many other "Scandinavian" flat-pack style furniture. My collection of Allen-keys is a testament to that. Still, IKEA's pictograph instructions always make me smile. Here I am, the intrepid homeowner, preparing to assemble my new purchase. First, I must speak aloud the names of the tools I will need. "I shall require a standard screwdriver, a phillips-head screwdriver, an awl, a pencil, a level, a hammer, and a clamp." Actually, I didn't need the clamp. I am next advised not to attempt to assemble this item alone, but that I should ask a friend for help. What's Swedish for, "My, what a big pencil you have"? "Thanks for the help, but there's still a pile of boards on the floor." There's more, but it gets all technical and stuff. And a little racy (they advise doing it on a rug), so I'll leave all that to your imagination. By the time you read this, the new bathroom cabinet should be totally assembled and installed. Ever the optimist. Photos to come. This is the southern wall of the bathroom. 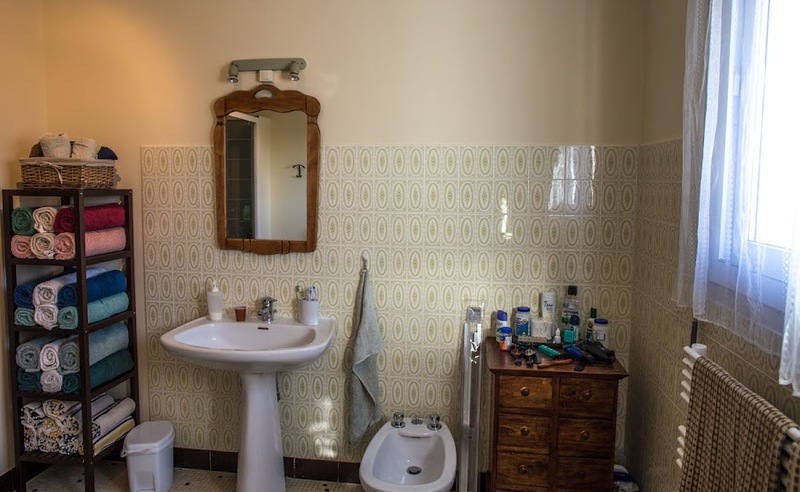 The window is on the western wall (on the right in this photo), the bathtub is on the northern wall (behind where I'm standing), and the new shower, which is just visible in the mirror, is built into the northeastern corner of the room. Got it? Now, that blank wall above the bidet and the chest of drawers is where the new medicine cabinet will go. It will be positioned horizontally just above the line of the tile. The cabinet door will open up toward the ceiling. The new cabinet will help us to eliminate some of the clutter on the chest of drawers. I got the screws and sleeves that I needed from the hardware store and will continue the mounting and assembly process today. Wish me luck! One day a couple of weeks ago, Ken was out and about and stopped at a bakery for some bread and a croissant. The bread was for lunch. The croissant was a snack. He was hungry. It came in this bag, which I found in the car the other day. 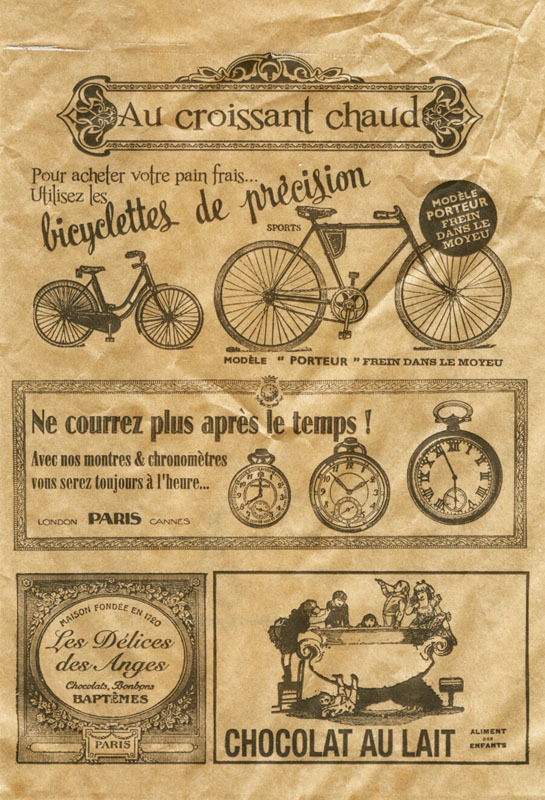 It's covered with old-timey advertisements. A bag for a croissant or two. I've started assembling the new bathroom cabinet. The base structure is all together, but I hit a snag. I need a couple of screws that are not provided by IKEA. I know, that surprised me, too. There are two options for attaching the cabinet to the wall: one is attaching a metal rail (which you buy at IKEA) to the wall and hanging the cabinet from it, the other is omitting the rail and screwing the cabinet directly to the wall. I chose the latter, and IKEA apparently doesn't provide the screws for that option. So I'm heading out to the hardware store. On Monday we drove over to Tours to the IKEA store. We had a small list of things to get or do, and one of them was to look at sofas. The sofa in our loft is thirteen years old and is wearing out. We used it in the living room until the loft was built, then moved it upstairs to serve as the tv-watching couch. Parts of it are threadbare and there are tears in the upholstery. It's time to replace it. Trees rising up out of a ravine where a stream flows to our south. We looked, but didn't buy anything yet. It'll likely wait until after the holidays. 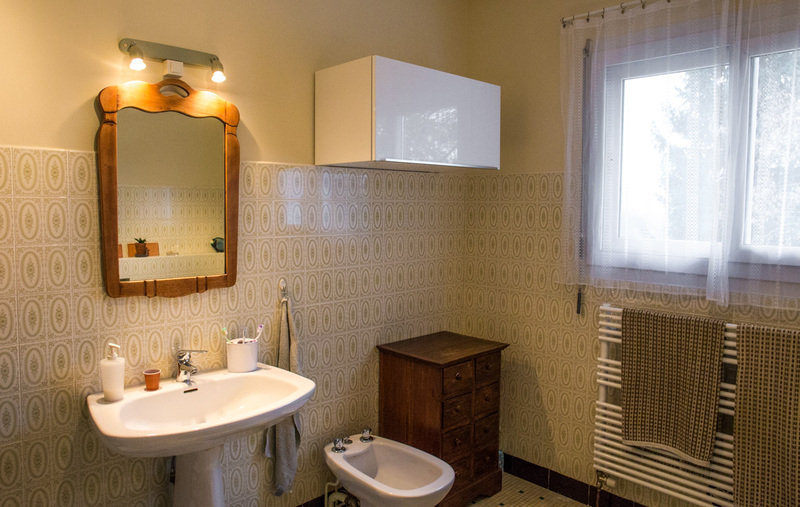 We did get something else on our list: a storage cabinet for the bathroom. Our "medicine" cabinet came down when the new shower was built. We decided to replace it with something larger and more modern. A horizontal kitchen cabinet unit from IKEA is what we found. It's part of their modular cabinet line called METOD and it's a plain white cabinet, with a shelf, and a horizontal door that swings up rather than opening to the side. I haven't described it well, but I'll show you photos when I get it assembled and installed. It came in five different packages. We also got a couple of other small things (easy to do at IKEA) and, on the way out, we stopped for a couple of bags of their famous meatballs. We'll be having them for lunch today. I've never had IKEA's meatballs before, but people have told us that they're pretty good. I'm surprised that they're already assembled and ready to eat. The fog is back with a vengeance. We didn't see the sun at all on Sunday. We had a brief rain shower in the place of a sunrise, and then gray drippiness all day until it all faded to black. Some days are like that. I'm happy that we don't have a foot of snow on the ground. The view toward the west from the guest room window. 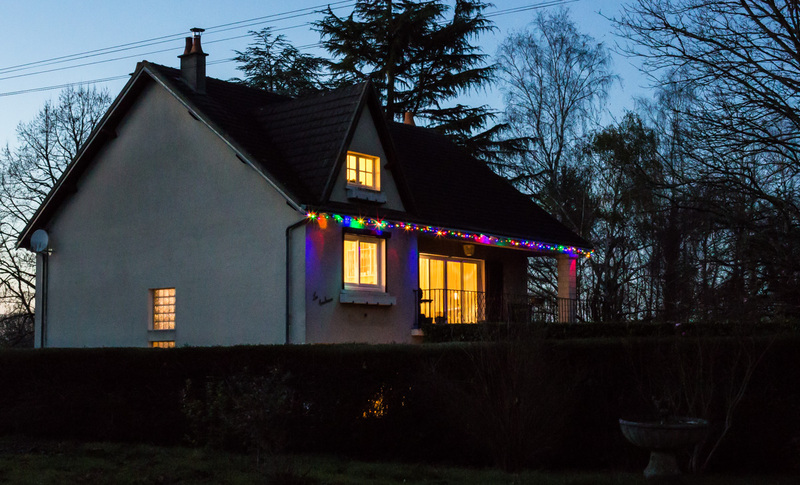 The festive lights on the outside of the house help to make the spirits bright. And hearty winter food gives comfort. Soon the tree will be up indoors for more bright festivity. The sunny days we do get are nice. It won't be long before the solstice and the lengthening of days. It's time for the annual holiday lights photo! I mentioned yesterday that I had put the lights up on the outside of the house. Here they are. I have been using this string of colorful LEDs for the indoor tree for the past couple of years but decided to put them on the house this year. Last year's outdoor lights were all white. These are so bright that they light up the house across the street. I turned all the indoor lights on for the photo. It's not usually that bright inside the house. I just got another string of all-white LEDs to replace the old string of incandescents. They are blanc chaud (warm white) and will go on the tree this year, then out on the house next year (if I remember). I'll get the tree set up sometime in the coming week. Recent days have been a lot less foggy than a week or so ago. Blue sky and sunny afternoons are feeling very nice. The daily high temperatures are not warm, but they're not cold, either. That's our temperate climate. Winter's chill is often tempered by the effect of the Gulf Stream in the North Atlantic. Under the dividing line between overcast and clear skies. I did get the holiday lights up on the house on Friday. I haven't taken any photos of it yet, though. Soon. This year I've abandoned the old incandescent mini-bulbs, many of which were burned out, for newer LED mini-bulbs. I'm struck by how much brighter they are. It's Friday. But it doesn't mean what it used to. Since retirement, Friday is just another day. Same as Saturday. Or Tuesday. We'll be eating leftovers from yesterday for lunch today. Ken made a coq au Riesling (a chicken fricassee), but used pintade (guinea hen) instead of a rooster or other chicken. Tasty! 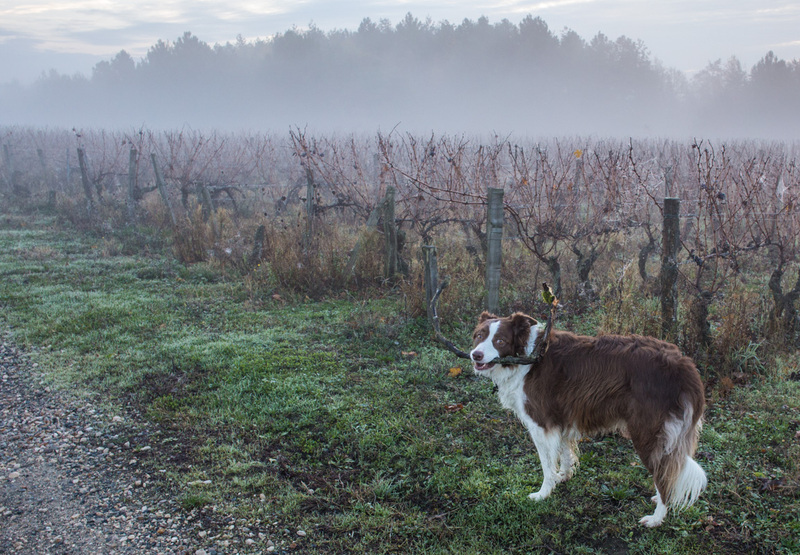 Another foggy morning in the vineyard. 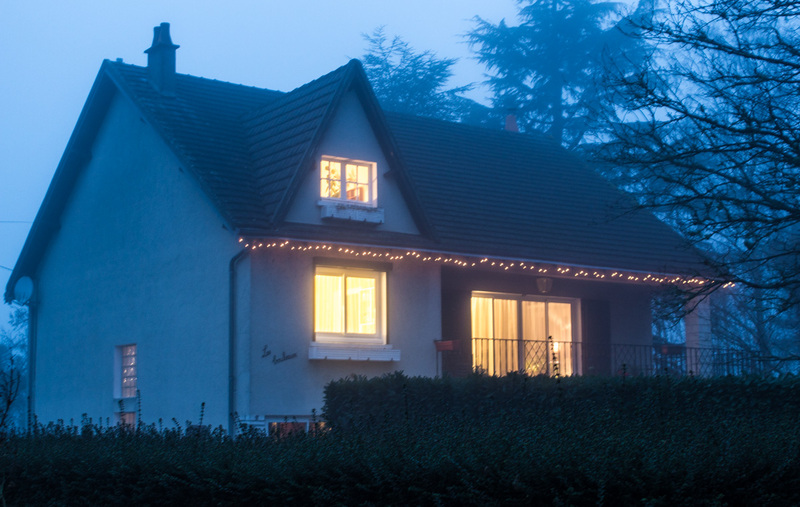 One thing I want to do either today or tomorrow is to get the holiday lights up on the house. It may start raining again on Sunday, so I'd rather get it done before that. 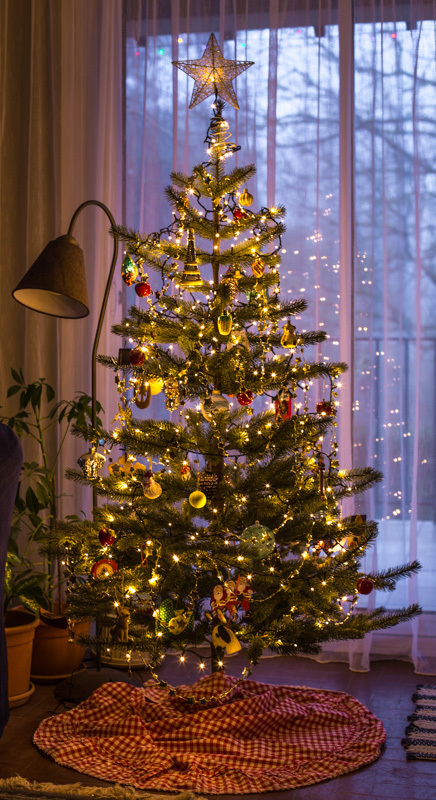 It's not hard to do, just a matter of pulling out the ladder and stringing up the lights. I installed the hooks last year, so I don't have to do that again. Wednesday morning's sunrise was pretty dramatic. We had less fog than recent days and there were enough gaps in the clouds for the sun to light things up nicely. I grabbed the camera and went out onto the deck to take some pictures. Wednesday at about 08h15. Looking southeast across our neighbors' property. The sun is rising in the southeast now as we approach the winter solstice. And it doesn't get very high in the sky before is sets again in the southwest. Our latitude places us a little further north than Montréal, Canada. Today we will have eight and a half hours between sunrise and sunset. That's fifteen and a half hours of darkness. 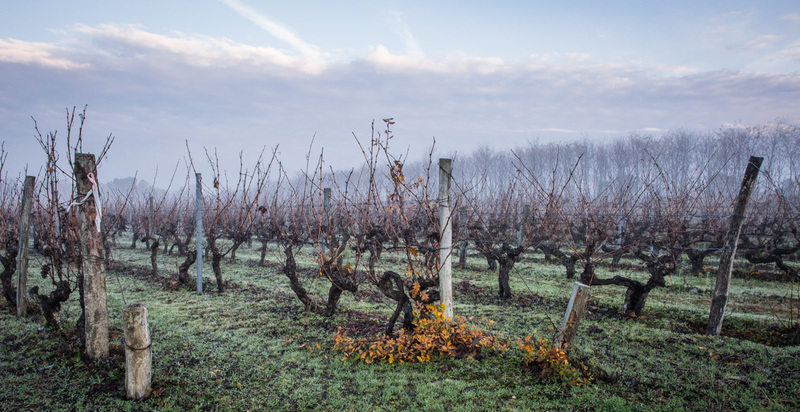 The leaves are all gone from the grape vines. Pruners will be cutting the bare canes away, leaving either a single cane or several smaller stubs that will sprout new growth in spring. Some parcels are already done, but most still look like this. Bare grape vines waiting to be pruned. I got my hair cut yesterday. The woman in our town who cuts hair is pregnant and due very soon. The last time we went in for cuts she made our appointments for this past week in advance (which is not her normal practice) so we'd be guaranteed a slot just before she goes out on maternity leave. She said she was unable to find a replacement while she's gone, so her shop will probably be closed until her return in late January. I was nervous as my appointment day approached because, well, anything can happen. I half expected to see a note on the door saying that the baby came early and the shop was closed. I didn't have to worry; everything went fine. But the stylist was certainly anxious. She's more than ready for that baby to come. Late fall high pressure is keeping fog pinned to the ground, with little or no wind to blow it away. The same weather is causing air pollution spikes in the cities, especially Paris, right now. Sometimes the fog layer is very thin and we can see blue sky through it. Other times it's a thick, dark blanket of gray. Morning ground fog with some blue sky above it. Lately the fog has burned off by mid-afternoon, which is why some of my recent photos show beautifully blue skies. Our nights remain clear, so the mornings are cold. 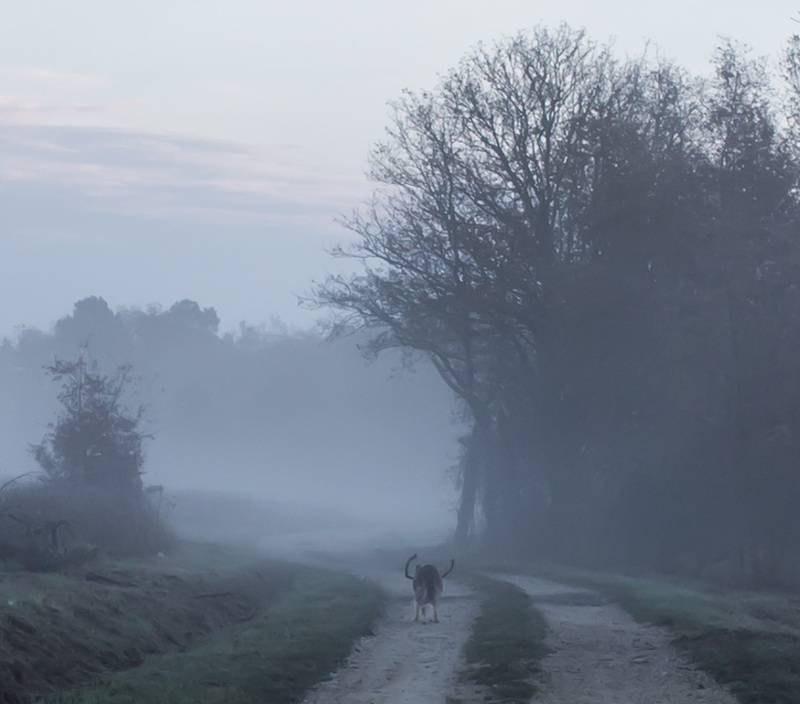 Then, as the sun comes up, the fog forms. Here's an exterior shot of the greenhouse from the side. For now we haven't acquired any "furniture" for inside. Those shelves are recuperated from the tent greenhouse we used last season. We may eventually replace them with something more sturdy; we'll see how it goes. I am planning to get a potting table to fit against the wall of the house where you see the rake and shovel standing. We did get that nifty curly hose for inside and it works great. 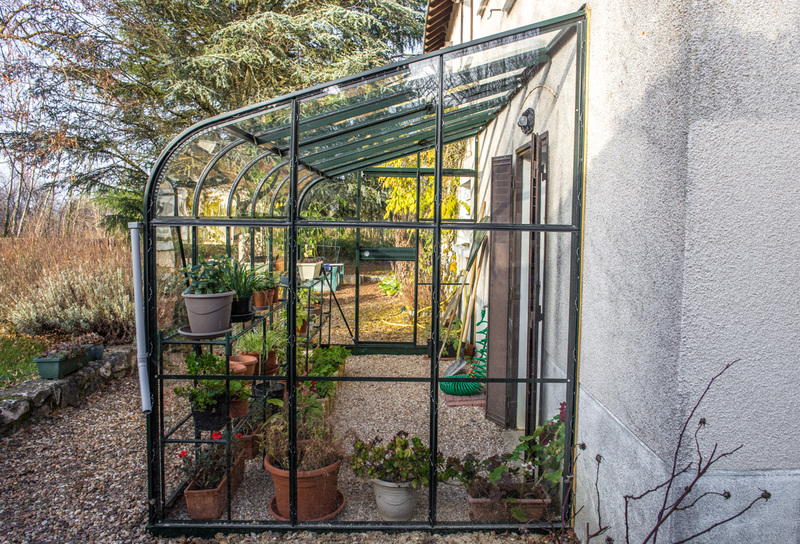 The greenhouse is built onto the western side of the house. This view is looking north. Under the curved panels is a small gutter that directs rainwater to the grey downspout you can see on the left. Eventually I'll put some kind of barrel/container there to collect it. Right now we're experimenting with over-wintering some deck plants inside, but the full potential of the greenhouse will be realized in spring when I start seedlings for the vegetable garden. I also plan to keep some warm-weather herbs, like basil, in there all season; they should enjoy the warmth. The roof has two panels that open for ventilation. Those, along with the door that slides open (on the far end in the photo) and the door into the house itself (access to the utility room), will work to keep an air flow going so it doesn't get too hot in there during the summer. At least that's the theory. I realize that I might have gone outside to take a better photo of the new greenhouse, but I didn't. So this shot from inside will have to do for now. We've been moving plants inside for the winter, mainly from the deck, but also from our heretofore winter storage place: the glassed-in front porch/entry. Now that space will be much less crowded with cold-sensitive with plants. On a sunny day it can feel downright balmy in there. It's all a big experiment, of course. 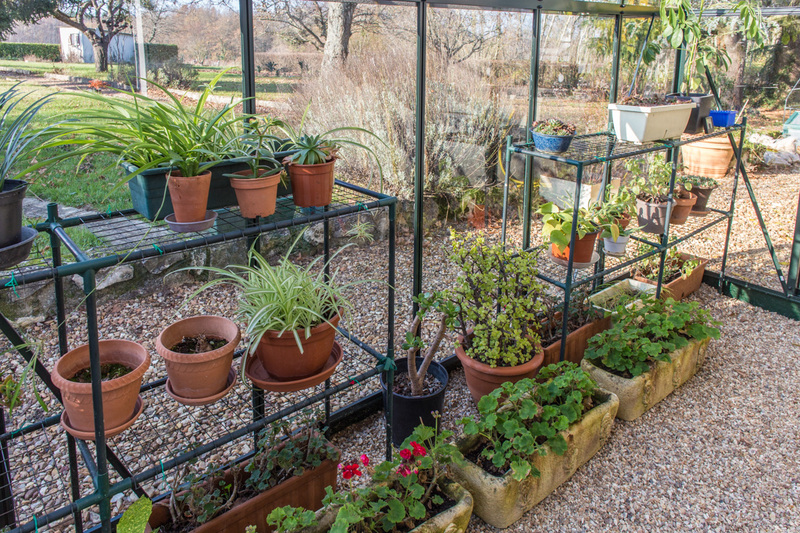 We don't know how much the greenhouse will protect the plants from the cold, especially if it gets really cold. The glass is single-paned and there's no heat except for the winter sun. Still, it should protect from wind and ice (like sleet and freezing rain), so that's a good thing. There's a thermometer in there that we check nearly every day to get a feel for how cool it is. So far it's been a few degrees higher than the lowest of the morning temperatures outside. That could make a difference. 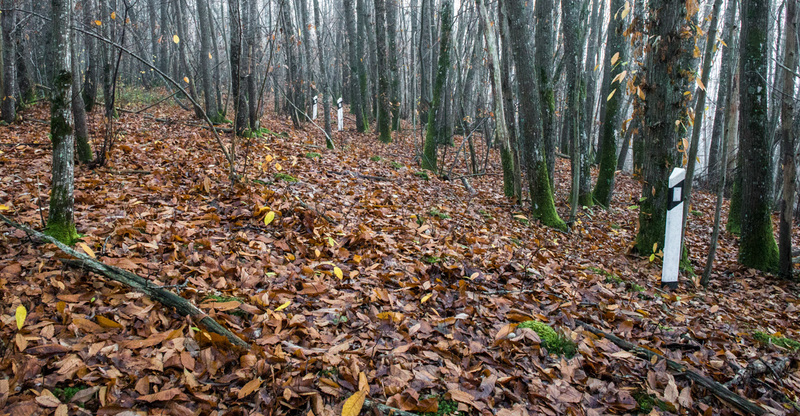 The artsy organized neighbor has taken to planting cast-away roadside reflector posts in the woods. I've noticed five or six of them placed in a straight line among the trees near his piles of stuff. Maybe they mark his property line? I don't know. Three of the half-dozen or so old roadside posts planted in the woods near where Callie and I sometimes walk. My theory is that this guy is a retired public works employee who is now at loose ends. He's collected things from his job over the years that would otherwise have been thrown away. But my theory is supported by very little evidence. There are just the piles of stuff, neatly arranged. If there's another explanation for his "installations," it is beyond my knowledge. Here is the artsy organized neighbor's most recent "installation." Your guess is as good as mine. I wasn't invited to the opening, although I'm sure it was replete with the who's who of the local woodsy art crowd. A stage set for some dystopian opera? A playground for leprechauns? I get (as in "understand," not "receive") the firewood. 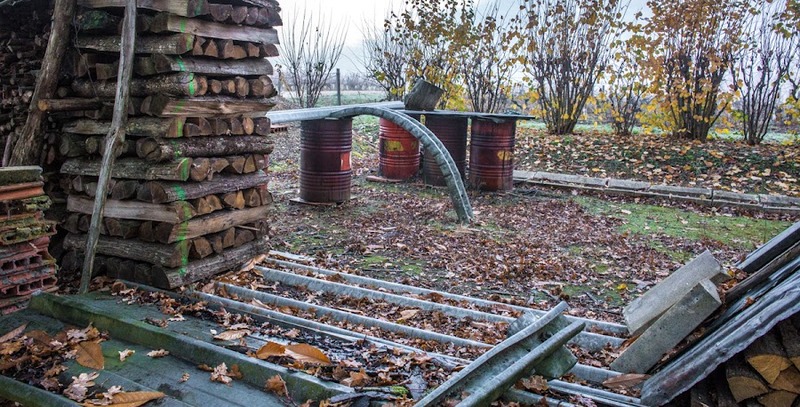 In fact, it's the one thing that changes all the time what with wood being taken out for burning and new wood coming in for storage. But the rest? Stacks of discarded roof tiles, concrete blocks, old broken roadside bollards, steel barrels, rusty machinery, and piles of gravel and sand. All neatly organized and occasionally rearranged ever so slightly. Have you ever seen "How the Grinch Stole Christmas?" It's a classic American holiday cartoon from 1966 based on a Dr. Seuss story. 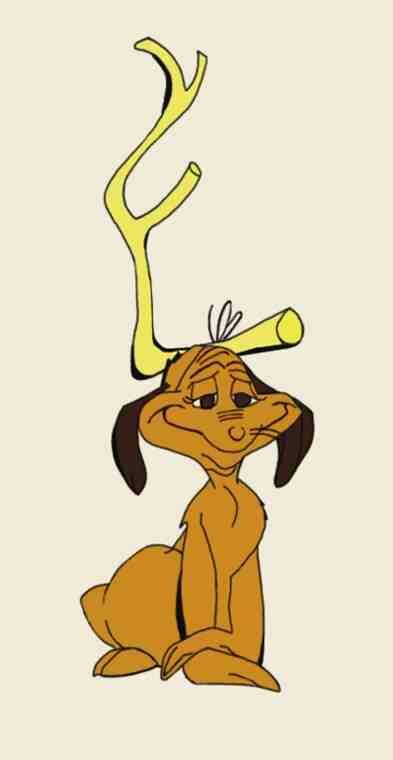 In it, the Grinch steals Christmas after disguising himself as Santa Claus and his dog, Max, as a reindeer. He does the latter by tying some antlers to the dog's head. Callie with her antlers, er, grape vine. So... the other day, Callie found a piece of a pruned grape trunk and decided to carry it home as she often does this time of year. This particular trunk was U-shaped. I couldn't stop laughing because Callie carried the stick so that the ends curled up above her head. She reminded me of Max from the cartoon. The most famous reindeer of all? It's Callie!